Imagine a fresh cool salad perfect for summer! Introducing the Summertime Watermelon and Avocado Salad and it’s a guaranteed hit at your next party! The world is finally starting to bloom. The trees are alive and bright with buds, the dandelions have taken over and the warm air is holding into the early evening hours. And I don’t know about you, but for me, that means sitting outside and recharging my batteries. Suns out, time to play. It can be as simple as sitting and enjoying a relaxing moment or two or kicking a soccer ball back and forth as we gear up for the next Major League Soccer game! Try as I may, my soccer game has a long way to go before I can even dribble well enough for the local team. 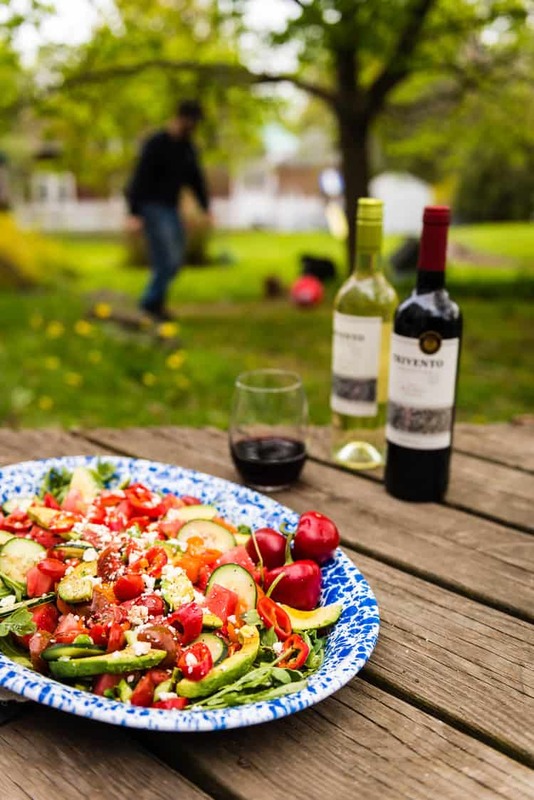 But on these rising summer nights, while I am grilling dinner and sipping some wine, it’s a fun way to burn off some extra energy and step out of the work zone. Last night the storms broke and the sky was filled with soft clouds and that beautiful late orange glow. I fired up the grill and decided to make use of what was fresh and on hand in my fridge. A simple meal made to look fancy. I grabbed a watermelon, slicing and nibbling between goals, some fresh brats, and asparagus. Then quickly whipped up a killer salad, grilled sandwiches and side all between goals. This watermelon salad came to mind knowing I didn’t want anything heavy. I had arugula waiting to be used, feta and an avocado perfect for picking. It was begging to be made. This was what I think of as a clean out the fridge sort of salad, that really ends up looking made for TV. 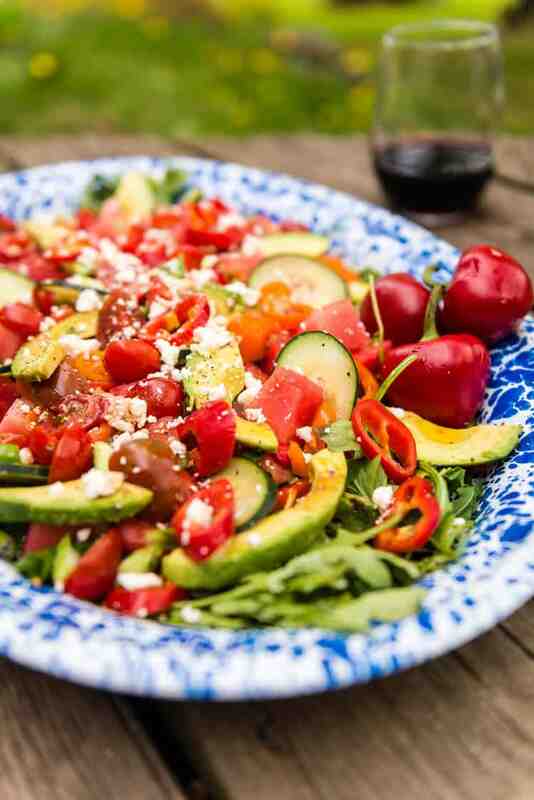 Want a bit more summer salad inspiration? Check out all the Salads in the Recipe Archives. By the time the sun had set, the night was perfect and I had decompressed from the day. It’s wasn’t a big pre-game MLS party, but it could have been. 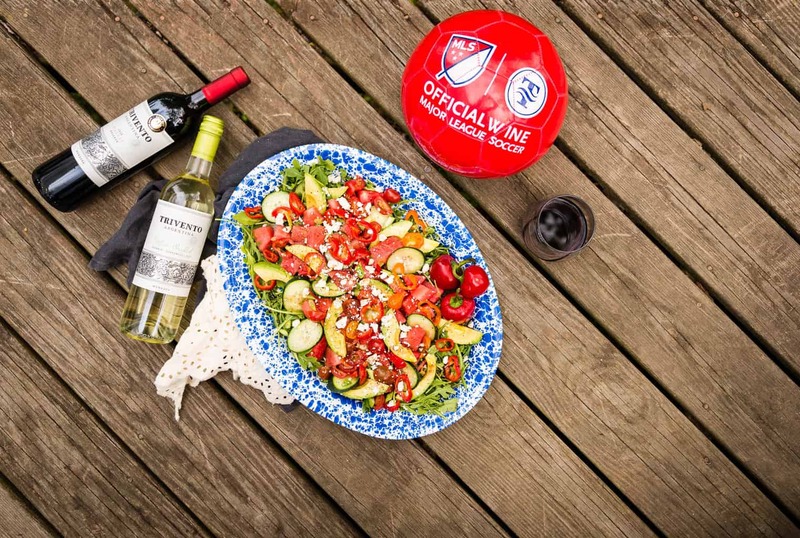 Trivento, the Official Wine of Major League Soccer (cool, right?! ), was the perfect post-work, pre-game sip for me! Now to start planning the next game night party and figuring out who I am rooting for (cuz, I got the food on lock). Bonus, Trivento has an MLS Loyalty program – Check it out. 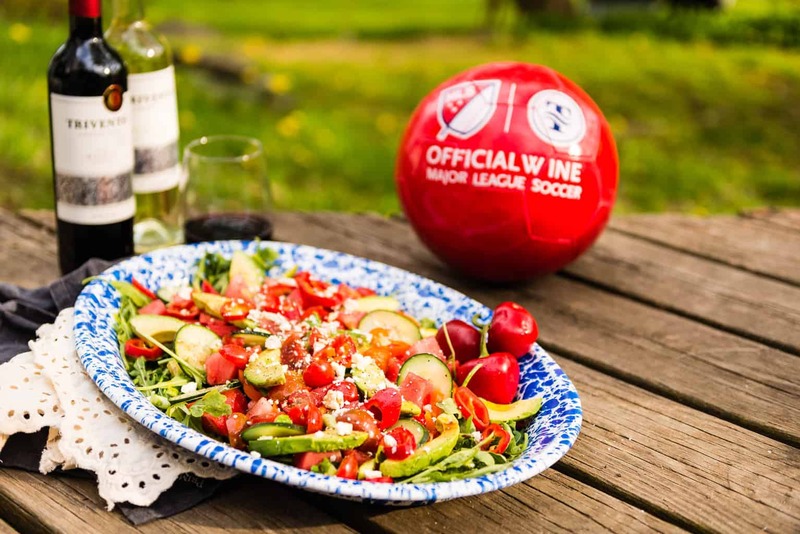 Soccer fans win, wine fans win, soccer-wine fans have it made! If you’ve tried my Summertime Watermelon and Avocado Salad recipe, or any other recipe on passthesushi.com please don’t forget to rate the recipe and let me know where you found it in the comments below, I love hearing from you! You can also follow along for more good eats and travel tips on Instagram @passthesushi & @girlcarnivore, Twitter & Facebook. Imagine a fresh cool salad perfect for summer! Introducing the Summertime Watermelon and Avocado Salad and it's a guaranteed hit at your next party! On a serving platter, arrange the arugula. Assemble the salad by layering the watermelon, avocado, peppers, scallions, tomatoes, cucumber over top. Sprinkle the feta over the salad. Drizzle with olive oil and balsamic immediately before serving. Squeeze a hint of lime juice over the salad just for a small pop of citrus. Season with a hint of salt and pepper and serve.